During 2017, owners and operators of U.S. nuclear power plants purchased 40 million pounds of uranium from foreign suppliers. Canada, Australia, Russia, Kazakhstan, and Uzbekistan represented the top five countries of origin and together accounted for 84% of total U.S. uranium purchases in 2017. A little more than half of these purchases originated from Canada and Australia, which provided 14 million pounds and 8 million pounds of uranium, respectively. The United States supplied 3 million pounds, or 7% of total uranium purchased by U.S. power plants. In 2017, U.S. commercial nuclear power reactors purchased 43 million pounds of U3O8. Purchases were 15% lower than the 2016 total (50.6 million pounds) and were the lowest amount since 1998, when 42.7 million pounds of U3O8 was purchased. 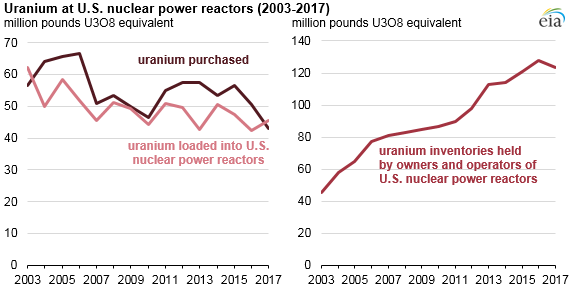 Although the amount purchased varies from year to year, increasing unit retirements and rising uranium inventories held by owners and operators of nuclear power plants both exert downward pressure on purchases. The September closing of New Jersey’s Oyster Creek Nuclear Generating Station left 98 operable nuclear units in the United States. Oyster Creek was the sixth reactor to retire in the past five years. Twelve additional reactors have announced planned retirements within the next seven years. 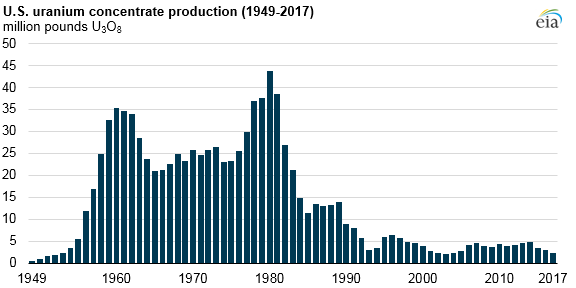 Given the nuclear retirement outlook, U.S. plant operators in competitive markets have curtailed plans for future uranium purchases. Preparing uranium for use as fuel in nuclear reactors involves several steps in the nuclear fuel supply chain. The production of U3O8, known more commonly as yellowcake, is the first step in the nuclear fuel production process. Uranium concentrate is then converted into uranium hexafluoride (UF6), enriched, fabricated into fuel pellets, and loaded into nuclear reactor fuel assemblies. 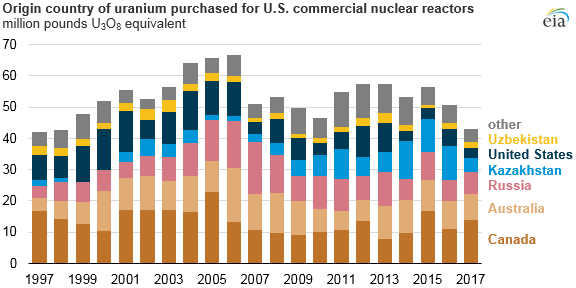 EIA's Uranium Marketing Annual Report presents data on purchases and sales of uranium contracts and market requirements, enrichment services, and other information pertaining to feed, loaded uranium, and inventories. More information on the United States uranium industry is available in EIA's Domestic Uranium Production Report - Annual, Domestic Uranium Production Report - Quarterly, and Uranium Marketing Annual Report.